Simple solitaire with a twist - Unusual and contemporary and each designer ring unique. This is no ordinary diamond solitaire ring - the 18 carat white gold bubble band sets it apart from the rest. The consistent rounded edges make the whole ring sparkle. 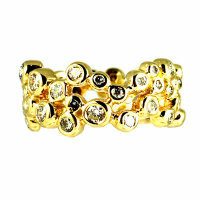 Please note this ring is handmade to order, so please allow 4-5 weeks for delivery.